Iranian officials have spoken out against US President Donald Trump’s offer to meet Iran’s leader. 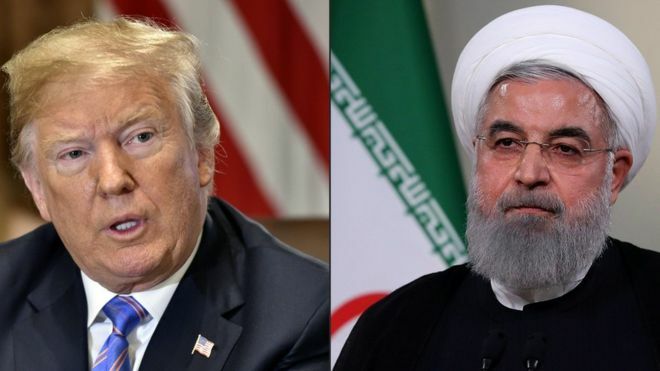 Mr Trump said he could meet President Hassan Rouhani with “no preconditions” at “any time”, after the two traded hostile threats earlier this month. Iranian state media quoted politicians as saying such talks would have “no value” and be “a humiliation”. In May, the US abandoned a deal which curbed Iran’s nuclear activities in return for the lifting of sanctions. The US is deeply suspicious of Iranian activity in the Middle East and is an ally of Israel and Saudi Arabia, two of Iran’s foes. Trump told the world on Monday: “I would certainly meet with Iran if they wanted to meet. I don’t know that they’re ready yet.” That may be one of his more accurate statements of late.